This example shows how to use RowDataBound Event in a GridView for highlighting the Rows or Cell in ASP.NET. This example is helpful in situations where you have to Highlight the GridView Rows or cell based on specific condition. For demonstration, I have created a database (named Database.mdf) in which we have a table (named tbl_Employee). 1) Drop a GridView Control from the toolbox and set the AutoGenerateColumns property to false. 2) Add a Columns Collection (element) to manage the collection of Column fields. 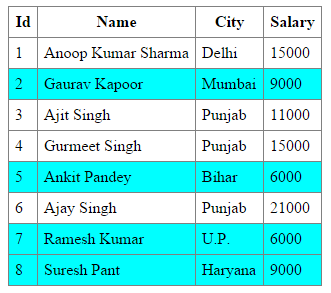 3) Inside the Columns tag, add a column field (BoundField) that displays the value of a field in a data source. 4) Set the DataField property to the name of the column in the table for binding to the BoundField object and set the HeaderText value for displaying it on the GridView's Header. 5) Add RowDataBound Event in GridView. 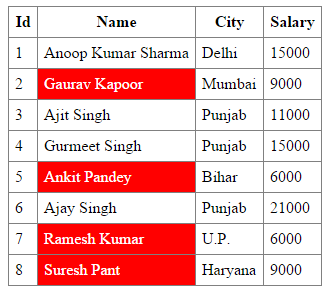 In this Example, I am going to Highlight the complete Row for the Employee who have Salary less than 10000.